The city and its landscape would not exist were it not for many violations against nature. There are some nice old trees in the more established sections of West Park Cemetery in Johannesburg, but the newer reaches of the Jewish section approximate the grasslands that existed before the Witwatersrand was settled. Around my father’s grave, right up against the koppie at the top of the cemetery and with excavations all around us for other new burials, the landscape seemed especially harsh and brittle. Burying the dead here scours you and dries you out, and you are grateful for the Jewish ritual at the end of it that requires you to wash your hands with a two-handled jug—one that you hold with your death-soiled hand and the other with your now-clean one. But West Park also, quite appropriately, makes you think about the earth: the red earth you shovel onto the pine casket, the red earth into which your loved one is dropped, the earth you wash from your hands, the earth you traverse so carelessly in a day and in a life. Often, I have left a funeral here discomforted by our denial of this earth, and I have been wondering recently if this is a condition specific to Johannesburg. “Nature” was actually imported into the highveld: there were almost no trees on the grasslands of the Witwatersrand, and Johannesburg’s developers realized that if their upper-end real estate was going to be attractive to foreign investors, it needed to be shaded. And so, when they planted the Sachsenwald forest on the northern slopes of Parktown Ridge to provide pit props for the mines, they decided to multipurpose the trees to provide shade for the settlers and to reduce the dust of the veld and of the mining activities. The project succeeded. Look at Johannesburg’s northern suburbs from the top of one of the ridges, or from my bedroom window up in the Melville Koppies, or from the sky or the Google Earth view, and you will see a vast forest that the birds have indeed endorsed; the largest man-made urban woodland in the world, according to the city’s publicity shtick. Plane and oaks, blue gums and jacarandas, immigrants all. Like the people who flooded into the city at the same time, these trees are exotics and have rooted well—even though they have been threatened by democracy. In an echo of the nativism that flickered across the country in the first decade of freedom, the new government declared shortly after coming into power in 1994—not without reason—that South Africa’s exotic trees were severely depleting its water table and needed to be uprooted. In Cape Town, shock teams took to Table Mountain to clear it of Port Jackson willows. The jacarandas that drizzle Johannesburg with their surreal purple haze every spring looked like they might be targeted, too, before they were granted a reprieve on the grounds of age: nearly a century old, they will die their natural deaths soon enough anyway. If the veld lurking on the edge of my childhood was the place of black people and Boers, of poisonous puff adders and ticks and bilharzia-transmitting snails in stagnant pools, then nature itself was conscripted to encamp a suburban laager against such threat: a canopy of oak trees and jacarandas and blue gums, a European screen of green, a fragrant curtain against this wilderness of cracked red earth and yellow grass and thorny silver scrub. Rising above Johannesburg’s man-made forests are piles of white and yellow sand extracted from the mines and dumped, in mesa-like formations, along the southern perimeter of the city. “Slimes dams,” “tailings dumps”: the names given to these man-made hills are wonderfully onomatopoeic. They were the mountains of our childhood, covered in grass and planted with trees and, in one case, with the Top Star drive-in theater, long an iconic image of—and view site over—the city. There are 270 of these mine dumps spread over 400 square kilometers, fashioned from more than 400 million tons of earth removed from the mines. They provide the negative image, above ground, for what is going on below, and you can trace the route of the ore-bearing reef from above by following their line from east to west, just south of the ridges of the Witwatersrand. It is no coincidence that the green canopy of the Johannesburg urban forest spreads northward from this, while the tightly packed, treeless, zinc-roofed mass of township housing, glinting silver in the sun, is to the south. The mining lands formed an obvious buffer between the white parts of the city and the black ones: an urban vacuum, in effect, that reminded me, conceptually, when I visited Berlin for the first time in the mid-1990s, of the empty space left by the destruction of the Wall. Once the mines were depleted and shut down, the mining lands became even more desolate, with rusting infrastructure strewn between the slimes dams as if by a capricious giant who had come out to play in his sandbox and then got bored and stomped off. The open shafts began to decant toxic water into the biosphere, and the abandoned miners’ houses and hostels became squatted by the poorest of the new migrants seeking refuge amid the discards of the modern city, the car wrecks and the scrap heaps. Much of this empty land cannot be developed because it is literally undermined. The water filling the dolomitic rock cavities to the south and west of Johannesburg destabilizes the landscape to such an extent that the earth’s crust often collapses into sinkholes. I first heard about sinkholes from Granny Gertie, who had traded her grand piano—her only asset of any value—for some land that had turned out to be riddled with them and thus useless. I remember some terrible nightmares about our secure suburban redoubt collapsing into the earth, and needing to be reassured that we were far enough away from the mines not to have to worry about this. All children, I imagine, express their unconscious terrors through the metaphors provided by their environments: if I had been Californian, I’d have been waking up with the house shaking; if Sicilian, covered in molten lava. We know how humanity’s tampering with the environment has exacerbated the risk of natural disaster, but Johannesburg is different, for its vulnerability is entirely man-made—a paradoxical consequence of the city’s very conception. I think I have always known this, but I only really understood it when, in early 2012, I took a tour of the mining lands with a woman named Mariette Liefferink, Johannesburg’s own Erin Brockovich. Liefferink is a glamorous Afrikaner then in her early 60s, a former housewife and Jehovah’s Witness missionary who had found new meaning by exposing the way mining waste was contaminating the environment. With her always-reddened lips, her wardrobe of dramatic Chinese silk coats and her coronet of peroxided hair, she had become a familiar sight in the mining towns west of Johannesburg as she has picked her way tenaciously across the ghoulish landscape of mine dumps and runoff dams in stiletto heels, gathering research showing the effects of what has become known as acid mine drainage. One of the major challenges in mining the Witwatersrand, she explained to me, was its very high water table: the name itself means “ridge of white waters.” And so the mining companies set up extensive pumping systems to drain their underground caverns, thus creating a huge “void” (the scientists actually use this word) beneath the city. For as long as they mined, they pumped, but as the older mines became worked out and shut down, the pumping stopped. The mines began filling with water, which became contaminated with salts, sulfuric acid and heavy metals—including uranium—as it interacted with both the exposed rock and the abandoned infrastructure. In 2002, this water began decanting through open disused shafts out of the Western Witwatersrand Basin; as a result, water of a foul, rust-red color (the result of the oxygenation of iron pyrite) was released into the region’s water supply, leaving a thick crust of solidified heavy metals known as “yellow boy” along the sides and beds of rivers and dams. As we watched a sulfurous, rust-red cascade of water gushing out of a shaft outside of Randfontein on the West Rand, Liefferink cited studies demonstrating that this decanted toxic water was unfit for human or animal consumption or for agricultural use, and that it would eventually kill all aquatic life. Due largely to her activism, the state had recognized the severity of the problem and had begun an ambitious program to neutralize the water. Scientists in the field believe this will make a difference in the long run, but no one can say how long it will take, and Liefferink believes the matter requires urgent intervention. The only solution, she told me, was to begin pumping out the water from the mining cavities again—and to commit to keeping these pumps going ad infinitum. Liefferink took me to Tudor Shaft, an abject informal settlement on top of a mine dump outside the township of Kagiso, where we met an elderly man covered in lesions: these, she said, could well be the result of exposure to radioactive uranium. Tudor Shaft was one of thirty-six areas in the province of Gauteng that had just been declared radioactive hot spots by the National Nuclear Regulator. All mine dumps contained tracings of radioactive uranium and cyanide, Liefferink told me, and the regulator had ascertained that more than 1.5 million people lived on top of them or too close to them and would need to be moved. As at Tudor Shaft, most of the people at risk lived in informal settlements: a toxic wasteland is an easy fit for surplus people. Upon arrival at Tudor Shaft, Liefferink pulled several bags of Woolworths groceries out of the back of her hefty four-wheel-drive bakkie and began to distribute them. In that listless, unfocused way of very poor and hungry people in the midafternoon heat, children were corralled into a line by an elder, each to be handed an Easter egg and a polished red apple. This ritual, she told me, symbolized her good intentions and ensured her continued access to the community. Still, when she stopped on the way out to caution a group gathered around a rough kiln making bricks out of the toxic sand, a woman came rushing up to the bakkie screaming bloody murder, accusing her—presumably because of her white skin—of being an agent of the opposition Democratic Alliance party. She is right, of course, to hold both the mining houses and the state accountable. Still, as I tried to internalize the landscape of blood-colored water against the neon crust of yellow boy, this topography of my hometown, this dystopia just a few kilometers away from my birdsong-endorsed aerie on the Melville Koppies, it seemed to express a deeper dilemma. None of us would exist—the city itself would not exist—were it not for these violations against nature. There is no reason for Johannesburg before or beyond them, but now it exists, despite them. This is our inheritance. And a part of this inheritance is being smuggled away before our very eyes. In recent years, as the price of gold has risen, the city’s mountains have begun to fade away. The mining companies have begun resifting the mine dumps for gold deposits, and they are disappearing, taking the Top Star drive-in with them. In this second brewing of the mines, the original attempts to secure the dumps with grasses and trees have been disrupted: now, more than ever, the heavy mineral and sulfite deposits are blowing across Johannesburg and running off into its rivers. to where the last of the mine dumps are—sulphur-coloured artificial hills, laid waste by the ravages of weather and reprocessing, shored up with scrubby grass and eucalyptus trees. Ugly valleys have been gouged out and trucked away by the ton to sift out the last scraps of gold the mining companies missed the first time round. Maybe it’s appropriate that eGoli, place of gold, should be self-cannibalising. As a child, Kentridge said, he felt “cheated of landscape. I wanted a landscape of forests, of trees, of brooks—but I had this dry veld, beyond the green gardens of the city.” He resolved this for himself by starting to draw “the terrain itself—partly as a way of taking revenge against its barrenness, its dryness.” And he describes the congruence between his medium—charcoal—and this barren, mutable landscape: “There is a way in which the dryness of the winter veld, when the sun is very harsh and the grass is bleached very white, or else is very black from the veld fires, corresponds to the tonal range of a white sheet of paper and charcoal…. 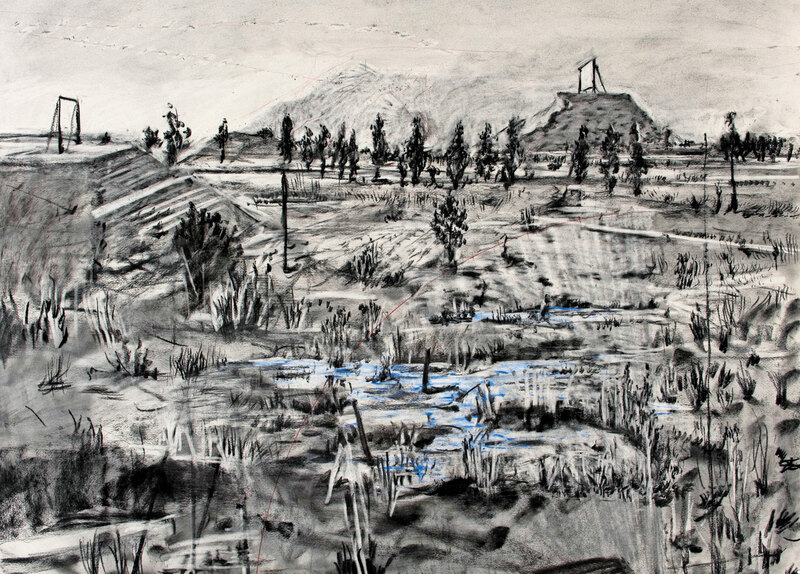 There was a way in which the winter veld fires, in which the grass is burned to black stubble, made drawings of themselves.” You could rub a sheet of paper across the Johannesburg landscape itself, Kentridge said, and you would come up with a charcoal drawing. As a child, I felt not so much cheated of landscape as oblivious to it. Beyond my vivid childhood memories of the Sandspruit, I had no knowledge at all of the profusion of streams that flowed down the continental watershed of the Witwatersrand and fed into two substantial rivers, the Jukskei to the north and the Klip to the south, that drained into the Indian and Atlantic oceans, respectively. You need know only one thing about these two rivers to get a sense of their marginality to the development of Johannesburg: the black township of Alexandra is sited along the Jukskei, and the black township of Soweto along the Klip. To the extent that I thought about nature at all, it was elsewhere. Given my father’s forestry job, we spent many weekends and holidays in the forests on the Eastern Transvaal escarpment: that was where wilderness resided, and even there, it was bounded by the battalions of pine trees marching relentlessly over the mountains. Nature was what we got when we arrived in Sabie after a few hours in the car, suffocating in the fug of my father’s Peter Stuyvesant cigarettes. What we drove through to get there was known as “the veld”: it was a transit zone rather than nature itself. Or nature was the beach, and the sea, where we went for summer holidays. As a boy, I had read in a children’s compendium of Norse myths of Canute’s defiance of the tides, and I turned this into a solitary game I played along the shore: I would walk up and down the beach endlessly, controlling each wave by beckoning it in, commanding its arrest and then dispatching it out again. Every young child I have taught this game to has been enthralled by it, for the same reason that I was: the illusion of mastery it gives you over the elements. Nature bent to our will. The swimming pool as measuring unit for a volume of water to be unleashed upon the city seems apt for Johannesburg; well, for my Johannesburg, at least. Despite the fact that we went, occasionally, to the Zoo Lake (there was an annual holiday children’s show of Treasure Island performed there, on a pontoon stage set up in the skanky water), the only blue in my internal Johannesburg map was that which filled swimming pools. Like William Kentridge and Ivan Vladislavic, I, too, imagined my world as flat, thrown into relief by some mine dumps. Given the natural topography of the Witwatersrand as represented so beautifully in those conical scratches made by Tompkins, such obliviousness is inexplicable. It strikes the adult in me as precisely the consequence of the type of blinkering we endured as white suburban children in apartheid South Africa. We lived in an artificial world, our own void of sorts, dug out of the earth by the hunger for gold. Mark GevisserMark Gevisser is an Open Society Fellow. His latest book is A Legacy of Liberation: Thabo Mbeki and the Future of the South African Dream.